Purée the apricot jam until smooth (a hand blender is useful for this), then put it in a sauce pan along with the orange liqueur. Over medium heat, simmer for 5 to 10 minutes, stirring occasionally to prevent sticking. Remove from heat and set aside. In another sauce pan, bring the cream, milk and salt to a simmer. Turn off the heat. Mix the cream and apricot purée into a large bowl. Refrigerate the custard for at least 6 hours, until cold, preferably overnight. Prepare following the instructions for your ice cream maker. 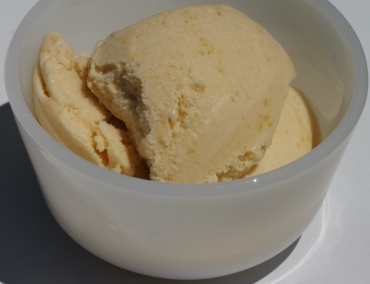 To avoid custard skin and apricot bits, pour the custard through a fine strainer, directly into the ice cream maker. I use the Cuisinart ICE Automatic with the gel canister, which should be chilled beforehand for at least 36 hours. It usually takes 35 to 40 minutes to churn; the alcohol lowers the freezing temperature of the custard, which adds more churning time compared with non-alcoholic ice cream. You should still keep an eye on it near the end, to avoid overbeating it. This recipe makes just over 1 quart. Scoop the ice cream into a storage container, then place it in the freezer for an hour or two to firm up before serving. This was written by sairuh. Posted on Saturday, July 14, 2007, at 11:43 am. Filed under Food. Tagged apricots, ice cream, oranges, recipe. Bookmark the permalink. Follow comments here with the RSS feed. Post a comment or leave a trackback. Making this now with ED Smith’s Orange Mango and Peach jam (big jar from Costco for $5.99 here in Toronto) and Cointreu. Thanks for the recipe.